The bridal wreath spirea, or Spiraea prunifolia, is a deciduous shrub that grows to heights of 6 feet. The dark green oval leaves turn purple to red in the fall. Bridal wreath spirea become covered with white blooms in early to mid spring. Blooms often appear before the leaves. Annual pruning is require to keep these shrubs shapely and to encourage healthy growth. Use sharp clean tools when pruning spirea. Bridal wreath spirea blooms are produced on old wood from buds that developed during the previous year. To avoid minimizing the flower producing canes before they bloom, only prune bridal wreath spirea after the blooming period is finished. Wait two weeks after flowers have dropped from their stems before pruning. If dead, damaged or diseased branches appear during the year, they can be removed at any time to increase the health of the plant. Only use clean, sharp tools when pruning spirea. 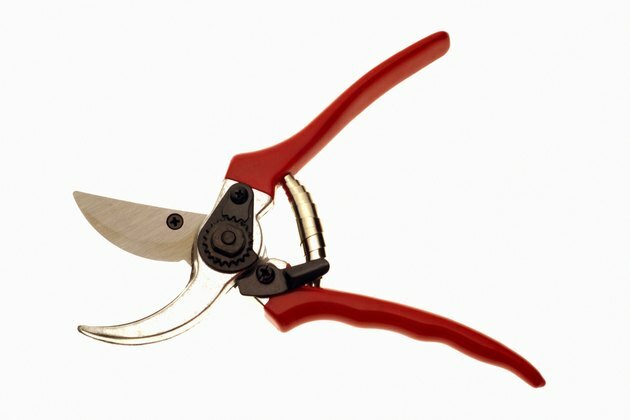 Use hand pruners for removing thin, green stems. Long handled loppers or hand saws are suitable for removing thicker, dried or woody stems. Wash the blades of your tools in warm soap water, rinse thoroughly and dry. Wipe the blades down with a cloth soaked in alcohol or bleach to sterilize them. Clean and sterilize your tools before pruning. Sterilize your tool after each cut if working with diseased branches to avoid spreading it to healthy stems. The first step in pruning a bridal wreath spirea is to remove any damaged, dead or diseased stems. Cut these stems down to ground level with the appropriate tool. Make all cuts at a 45-degree angle. Place diseased branches in a plastic trash bag and once all have been collected, seal the bag completely before throwing it away. Wash your hands and sterilize your pruners after cutting each diseased branch. Stand back and look at the general shape of the shrub. Note branches that droop to the ground or that are significantly taller than others. Remove these branches first by cutting them down to the ground. If there is a heavy flush of new growth, remove older branches to encourage the new growth to flourish. Older branches are darker in color and woodier. Remove branches from the center of the plant to thin it and allow sunlight to reach the new developing branches. Do not remove more than 1/3 of the spirea's stems to avoid damaging the health of the plant.